Barry Baker, retired General Manager of Delta College Public Broadcasting, passed away August 30, 2016. His funeral was held at the Davidson/Hermelin Chapel at Clover Hill Park on Thursday, September 1. The Rabbi David Nelson officiated. Barry Baker in 2015 after receiving the Professional MAPB Public Media Impact Award. Surviving are Barry’s wife Sherri Baker, his son Brett Baker and daughter Carrie Platner; his sister Marlene Krauetzker and brother James Baker. Grandchildren Dillian Tacey and Ryan Harris. His parents Marcia and Paul Baker predeceased him. Barry was a valued member of the Michigan Association of Public Broadcasters prior to his retirement and served on many committees. 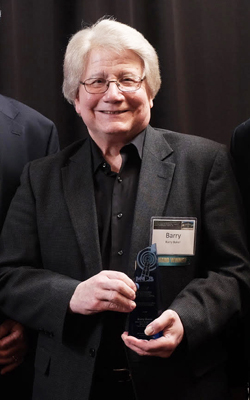 Barry was an active participant in the MAB Foundation, annually attending the Career Fairs, speaking at conferences and serving as a mentor at the speed networking events. Barry loved speaking to the students that attended these functions and encouraging them in their careers in broadcasting. Barry was witty, personable and a kind man who approached each issue with great wisdom. He will be missed by his friends at the Michigan Association of Public Broadcasters and broadcasting associates across the nation. Barry Baker was Executive Director of Communications Technology & General Manager for Delta College Public Broadcasting. Before coming to Delta College in 1997, Baker served as Executive Director & General Manager for Southern Minnesota Public Broadcasting stations KSMQ-TV and KMSK-FM from 1978-1997. From 1974-1978 Baker was Director of Operations and Production for the New Hampshire Public Television Network, where he won an EMMY in 1977 as Executive Producer/Director for “Best Entertainment Program.” From 1971-1974 Baker worked at public TV stations WSIU/WUSI in southern Illinois and was an instructor in the mass communications department at Southern Illinois University. Baker worked as a producer/consultant for the University of Western Ontario from 1970-1971. His initial exposure to the broadcast industry began in 1966 at Detroit Public Television as crew supervisor and studio director and as an engineer for ABC network owned WXYZ-TV/AM/FM in Detroit. Baker is a graduate of Wayne State University. Barry retired from Delta College in March of 2015.